3. We will check plant available once getting your order then make a proforma invoice, send it for your approval. 4. If invoice has been approved by you then please make payment and send a copy of bank receipt to our email : sales@siamadenium.com. 5. After your payment has been verified by our bank then we will start booking the flight, preparing the plants, applying a phytosanitary certificates and inform your the flight's reservation detail. 6. 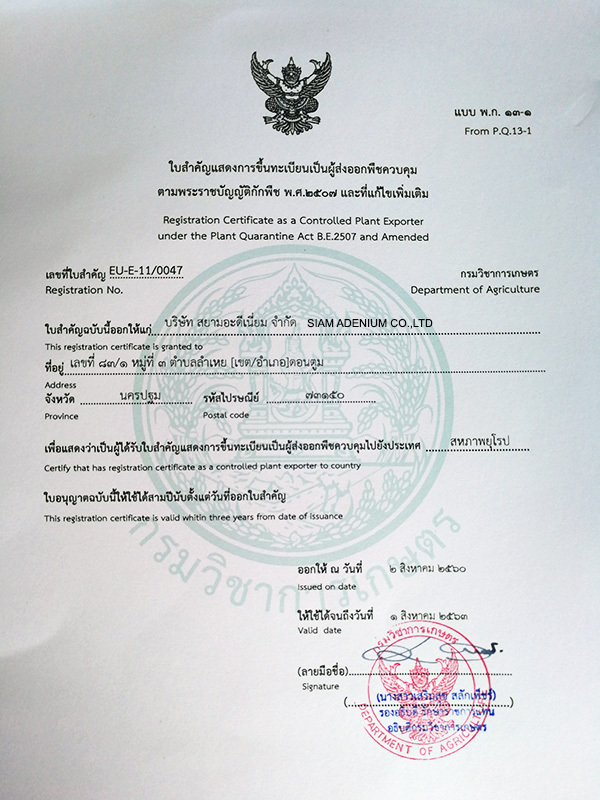 We will work for the plants quarantine process until a phytosanitary certificates has been issued by our Agricultural Department. 7. The plants will be loaded to airlines and depart from Bangkok to your destination airport. We will email you a copy of the air way bill (AWB), Invoice & Packing List, and Phytosanitary certificate to confirm that your plants have been loaded on board and the flight has departed on schedule. 9. After your shipments arrive to your destination airport then our shipment's agent will contact you to pick up the plants at the custom airport. 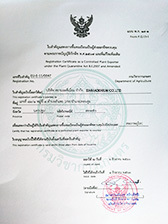 to declare with the custom officer there to release plants out of airport. 10. You will need to bring all recieved documents from item 7 to do the custom clearings and claim your plants. Our plants are very good conditions, shipped gently, clean and fresh as international standard. Our nursery is certified as “a Controlled Plant Exporter under the Plant Quarantine ACT B.E.2507 and Amended ” The customers in European countries can import our aquarium plants and garden plants with safe and good conditions as the EU regulation requires. All prices can be found in our price list. Prices are FOB Bangkok and quoted in $US or THB for credit card payment. 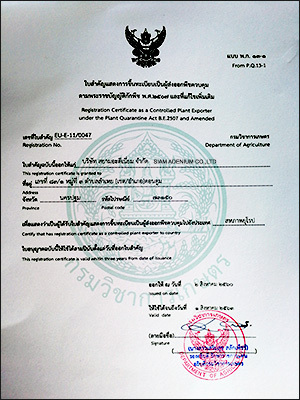 All shipments are accompanied with a phytosanitary certificate from the Department of Agriculture of Thailand.